Fade Fade the texture at the poles of a sphere. This allows the texture to be grafted to the top and bottom of the sphere such that the joins are less apparent. 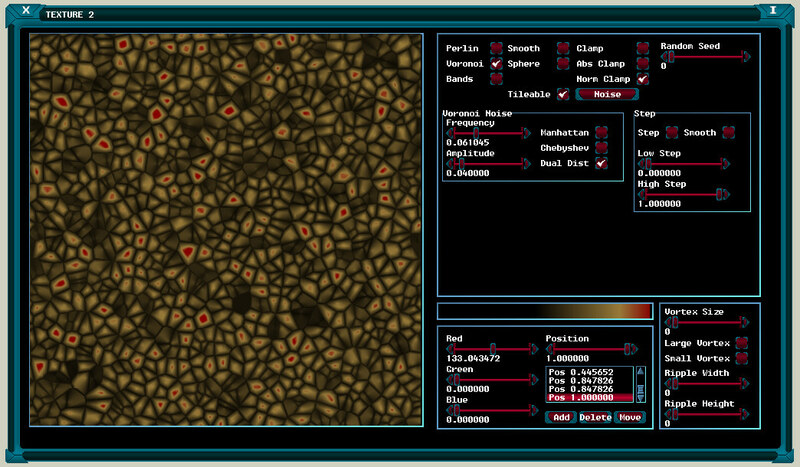 Tileable Allows a texture that is not sphere mapped to be made 'tile-able'. Clamp Standard Clamping. Clamps negative results to 0 and positive results to 1. Tends to produce textures that occupy the lower portion of the palette. Abs Clamp Absolute Clamping. Converts negative results to positive ones which are clamped at 1. Tends to produce noisy textures which occupy the full palette range. The options at the bottom left of the window allow the palette to be configured. 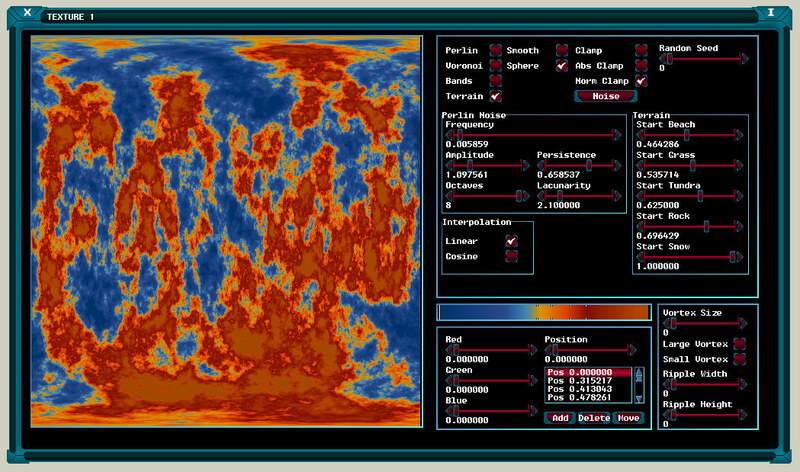 The results from the noise function are used as an index into this palette in order to retrieve the required colour. Amplitude Initial amplitude of the Noise. Higher values will produce textures which occupy the higher parts of the palette. Octaves Number of iterations. With each iteration more detail is added. Low values tend to produce blurred textures. Persistence Increase in amplitude for each iteration. Line Interpolation Tends to produce 'spiky' textures. Inner Lines Causes the outer lines to be culled. Amplitude Amplitude of the Noise. Higher values will produce textures which occupy the higher parts of the palette. Manhattan Produces cellular noise which takes the form of diamond shapes. Dual Distance Produces more complex textures. Jitter Amount of high frequency jitter to be applied to bands. Streak Blending Degree of blending of diagonal streaks through texture - a value of Zero disables streaks. 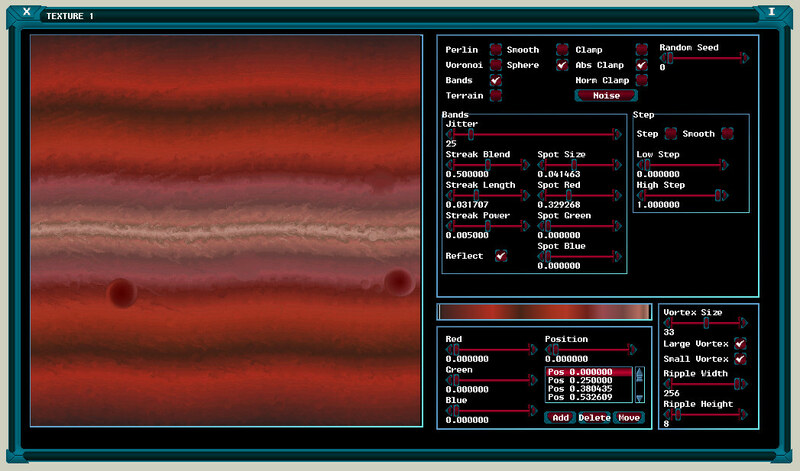 Streak Length Length of diagonal streaks through texture - a value of Zero disables streaks. Streak Power Gradient of diagonal streaks through texture. Spot Size Size of 'Spots' in texture - a value of Zero disables spots. Reflect Palette Reflects the Palette between the top and bottom halves of the texture. Terrain options are basically identical to those of Perlin Noise but contain a separate area on the right-hand side that indicates at which point various types of terrain should start. The position of each form of terrain is also indicated in the palette area. Large Vortex Causes large swirling vortices to be applied to the texture. Small Vortex Causes small swirling vortices to be applied to the texture. 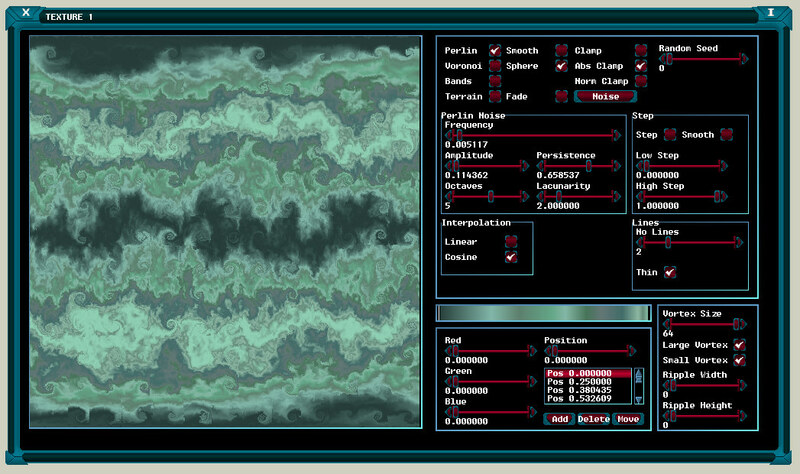 Ripple Width Configures the width of a ripple to be applied by the texture. In order for the effect to be tile-able the width should be able to divide into 512. Ripple Height Configures the height of a ripple to be applied by the texture. In order for the effect to be tile-able the height should be able to divide into 512.